Have you been searching for a "flat tire repair near me"? If the answer is yes, you should consider contacting us for tire repair service and tire rotation service. Our certified technicians can inspect your car's tires thoroughly and quickly while helping you decide if you need any repairs or replacements. We understand that tire repair cost is always a factor to consider, which is why we strive to offer you a variety of discounts and tire rotation coupons. Speak to one of our professionals at our Modesto, CA, and Meineke #2401 to learn more about our tire repair services. Keeping your tires in optimal condition is important for a myriad of reasons. First of all, well-maintained tires handle better on slick and uneven surfaces. Their ability to handle these surfaces means that you and your passengers are less likely to be involved in a collision. Tires also have a significant impact on your suspension system, and if they are not rotated periodically, you may have difficulty steering your vehicle. Tires are frequently overlooked by drivers, but the better your tires perform, the better your entire vehicle will perform. 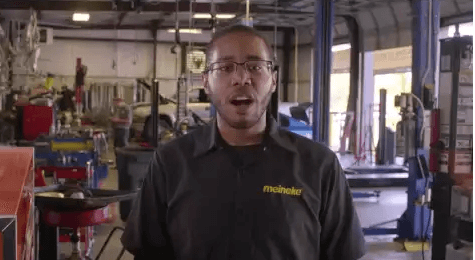 Stop by our Modesto, CA, Meineke #2401 store for a comprehensive inspection today. Wheels may need to be aligned after accidents or after too much wear and tear on a vehicle. Cars with tire alignment issues often show uneven tire wear. Drivers may also notice vibration through the steering wheel as wheels pull against one another instead of working in sync. If your car pulls to one side, it may indicate that your wheels need to be aligned. Bring your car or truck to Meineke #2401 in Modesto, CA, and we will gladly perform an alignment and tire rotation at the same time. Contact us for more information regarding tire rotation. Have you ever noticed how well your vehicle's different component systems work together? Unfortunately, they tend to deteriorate together, as well. You'd be amazed at how trying to avoid a simple tire repair cost can result in extensive damage to your vehicle. That's because unbalanced tires lead to increased wear on certain wheels as they try to support extra weight. Not only does this speed up their wear, but it also can affect your vehicle's suspension as it tries to compensate for this imbalance. Rather than allowing this to happen, research your "tire repair near me" options to find Meineke #2401 in Modesto, CA. Your tires will typically give you plenty of notice that you should look into tire replacement or repair. Low tire tread is a serious problem that can only be solved through replacing the affected tire and its twin. Cracking, noticeable wear on only one side of the tire and vibration coming through the steering wheel are all indicators that you should have your tires inspected by a professional. If you do not replace your tires promptly, they could pop while you are driving. Taking your car to Meineke #2401 in Modesto, CA for a full tire inspection and tire repair is the best option for safe driving. Because tires are your vehicle's only direct contact with the road, they should always be kept in the best possible condition. Tire rotation cost is a small price to pay to ensure that your vehicle is safe. Moreover, you can actually increase your fuel mileage by keeping your tires well repaired and maintained. Save money in the long run by taking your car or truck to Meineke #2401 in Modesto, CA for inspection, maintenance and repairs. We offer competitive pricing and tire rotation coupons to help you experience the best savings possible without compromising safety.